'What the heck is an Energoon?' We hear you cry. Well, these super-fun army of characters were created by Play ‘n Go, and are the back-bone of this all-action slot title. They look a little like Pixar characters, which, in a world of static playing card symbols and fruits, is a welcome addition. 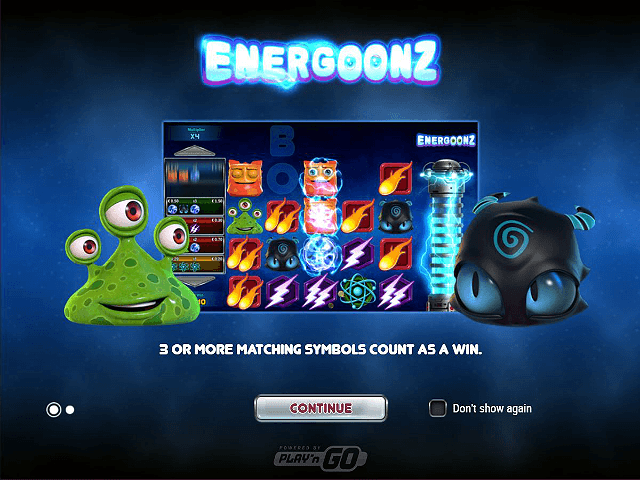 The Energoonz online slot game is reel-less, with the action unfolding on a 5x5 grid that features collapsing rows and columns. There’s a cool bonus round and multipliers that accumulate and grow in spectacular fashion, serving to show that Play ‘n Go have married style and substance yet again! Play Energoonz Slot Demo for Free! Play Energoonz for Real Money! As mentioned, the Energoonz slot doesn’t feature reels in the traditional sense. Instead, the colourful characters on show line up in a fixed 5x5 set-up. There are no paylines either, with winning combinations created vertically or horizontally in a row of three or more. The same symbols can be used in multiple win lines too, meaning any winning symbols disappear. Those remaining on the grid then drop down into a new position. Any further payouts are accumulated and displayed in the table on the left-hand side of the screen, with multipliers increasing with each ‘drop’. Hiding behind each column is the word BONUS, spelled out with each letter taking their place on the grid behind a symbol. Should you remove a complete column, the whole world will be revealed and the bonus round will be triggered. If you can clear the whole grid, a bounty of 1000 coins is paid out. 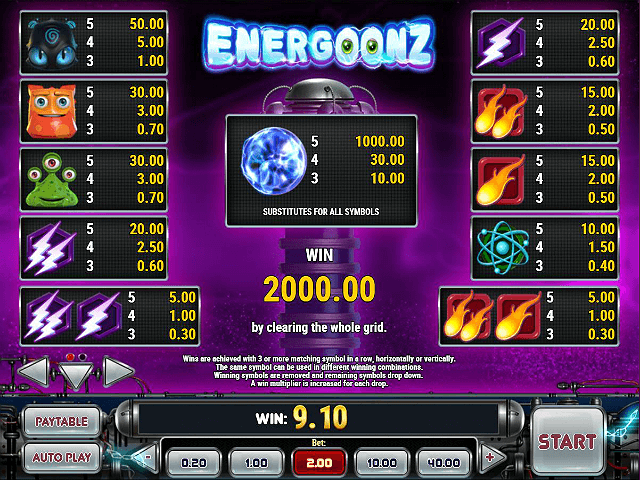 Energoonz online slot is an aesthetically pleasing game in which friendly animated characters are the stars. Each has their own unique personality and range of facial expressions – and it's the little touches like this that ensure Play ‘n Go's game stands out from the crowd. Because there aren’t any paylines in Energoonz, you can only modify the amount you wager per spin. There are five different categories available, ranging from the low budget to the more gregarious: all you need to do is click on your preferred amount. So hit the start button, sit back, and enjoy the high octane adventure ride! 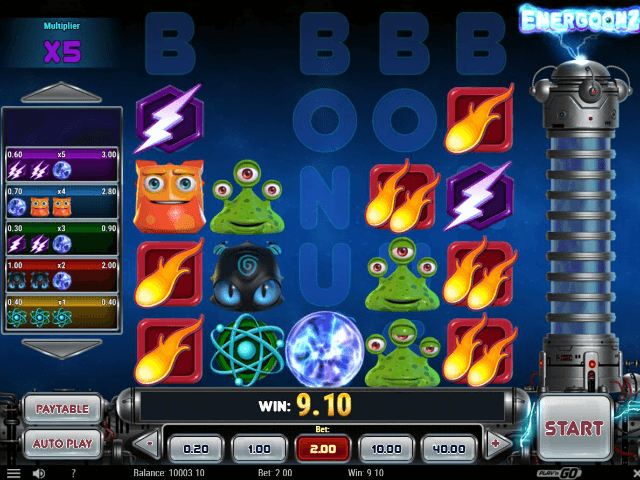 The key to unlocking the big wins in Energoonz lies in unlocking columns by picking up plenty of consecutive winning combos. This triggers the bonus round – the place where those major paydays lie. What's more, there’s a whole new paytable to take advantage of, with all manner of weird and wonderful creatures appearing on screen. (Consult the table for a peek.) In short, the payouts in Energoonz online slot range from 1.25 for matching five right up, to 175.00 for ten. The real key is the bonus round is embracing that matching symbols do not need to be lined up horizontally or vertically. Instead, you're looking to spin as many as possible anywhere on the game grid. There's one more symbol to keep your eyes peeled for in the bonus round: The Blue Lantern. This glowing icon can retrigger the feature with up to 20 free spins – just reveal five or more to keep the good times rolling. 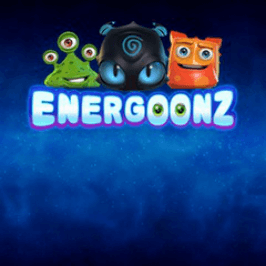 Share this Energoonz Review today! 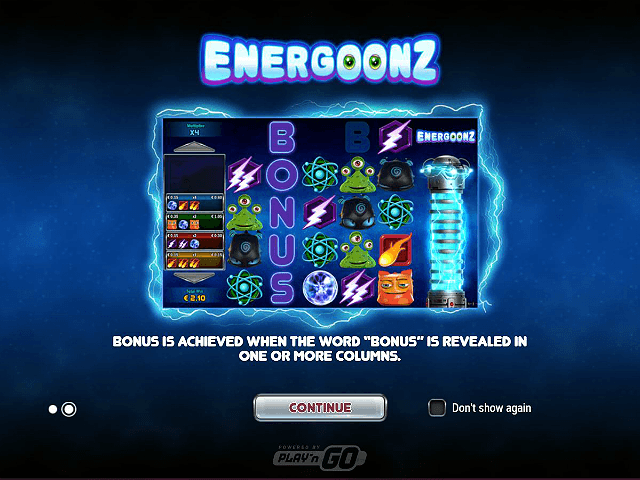 If you like Energoonz, you'll love these slot titles too!